When I first heard the theme for this month's Bread Bakers (pancakes), I pictured yeast, an overnight rise and later some cinnamon invaded my pancake dreams. It was going to be great. And then I read the description from our host Mayuri. We had to go global. I almost took the easy way out. Pancakes aren't really a part of my cuisine. (My friend and I are still arguing about whether a particular Jamaican dish is our version of a pancake. The "no" side is currently winning.) This meant I really could just do a North American-style pancake and take the easy way out. Yeast isn't traditional. Plus, I can still count the number of times that I've ever made pancakes so it still felt like I was exploring? No? I couldn't convince myself either. I was about to sit the event out because most of the pancakes that interested me included ingredients I can't get here. I also fell into a flatbread vs pancake rabbit hole. Lots of blurred lines there. 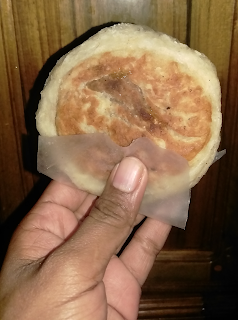 I ended up choosing hotteok, a Korean stuffed pancake, that actually seems more flatbread-like to me. However, all the sites used the word "pancake" in the English name. While I was making it, I realised that I did fulfil my pancake dreams - there's yeast and cinnamon! 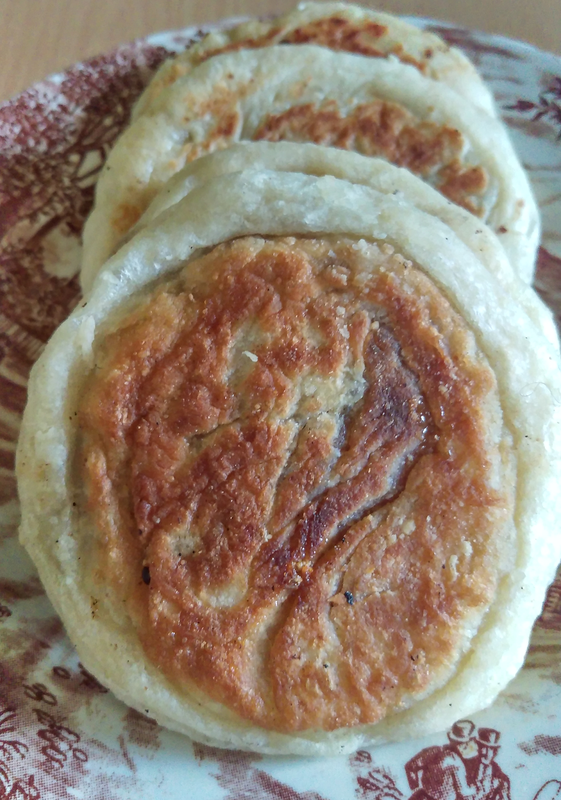 Hotteoks are a popular street dish during the winter and are served piping hot. Be careful though - that melted sugar can burn you. The sugar, cinnamon, and nuts filling is traditional. However, they can be filled with anything you desire. How about some cheese? A pizza filling? Nutella? Picky Nephew came over right as I was finishing these up. I thought about offering him one. But why let him ruin hotteoks for me? I stuffed a hot hotteok into my mouth and then listened to him talk about whales. Look, I know I sound like a bad aunt there. I promise you, I am not that bad. A couple weekends ago, he requested pancakes. I made them. "Did you flip them in the air? I wanted to watch you flip them in the air!" "Eat that one first and then I will show you that." No, I cannot actually flip pancakes in the air. "What do you mean?! You asked me to make them for you!" I later learned that he has never tasted a pancake. I guess he just saw someone making them on TV and placed a request. We tried to get him to take a bite and that was just hell on earth. So, no, I was not offering him any of my hotteok. Scroll down to see all the pancakes that the Bread Bakers made this month. Whisk together flour, sugar, yeast, and salt. Pour in the water and oil. Mix together for a few minutes then cover and let proof until doubled. When the dough has doubled, flour your work surface and oil your hands. This is a sticky dough! Divide the dough into 6 equal pieces, shape into a ball and let rest for 10 minutes while you make the filling. For the filling, make sure there are no large pieces of peanuts that may tear the dough. Flatten each ball and fill with about 2 to 3 teaspoons of the filling. Seal the ball. Heat a pan over medium heat with just enough oil to coat the bottom of the pan. Place a ball in the pan and cook for 30 seconds. Flip the ball and flatten with a spatula. Cook for 1 minute on this second side then flip the pancake again. Turn the heat down to very low and cover the pan. Cook for another minute so that the filling can completely melt then remove from the pan. Don't worry if the balls look a bit messy. It will look just fine when cooked and still taste amazing. What a funny exchange with your nephew. You are a good auntie! And patient! More for you. Oh Kelly, you make me laugh every time I read your posts. Kids seem to want what they see and he's missing out by not eating one of these. I love that you added cinnamon and would love them on my table! What a great stuffed pancake. The filling sound delicious! I made these too and loved them. Actually both my kids liked them (stuffed with Nutella, of course). Kelster I'm glad you didn't back out... look at the delicious looking pancakes you made. Have to try out hotteok. One day your nephew will learn what he is missing and might give these a try! Beautifully made! WOW!! I have Hotteok on my mind since long. Can't wait to make them myself! That peanut filling sounds like a great filling idea. He doesn't know what he missed out on! Kids are always like that... They will hear or see something in school or TV, and then request the same to be done at home... Though your Hotteock looks delicious. Hello Kelster, Your pancakes look lovely.The recipe is bookmarked for sure!